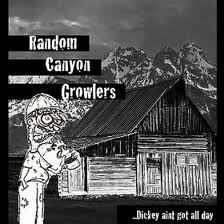 Before you listen to any of their music, the Random Canyon Growlers have already succeeded in grabbing your attention with such a vivid name that conjures up wonderful images of an old time traditional mountain band skilfully plying their trade around isolated rural communities. Therefore it is of little surprise that these visions gain further clarity as you absorb the musical content of this debut album from the five piece band who has found inspiration in their adopted Rocky Mountain home. The band is the brainchild of two musicians who followed their dreams and relocated from Vermont to Idaho in pursuit of their musical spirit. The resultant album, equally wonderfully named –‘ …Dickey Ain’t Got All Day’, is recorded proof that Jamie Drysdale and David McMeekin, along with founding bassist Matt Donovan, have captured that soul and added evidence that old time/bluegrass music is now in the safe hands of the next generation. With the classical combination of fiddle, double bass, acoustic guitar, banjo and mandolin to accompany the creative arrangements and incisive lyrics, this comprehensive sixteen track album deserves the honourable complement of holding your attention right from the opening bars of Drysdale’s fast pace driving number ‘With You Beside Me’ to its conclusion with McMeekin’s ‘Mercy’. With such a rich history of influence to draw from, the guys have tactfully paid homage to their heritage by carefully interpreting the work of four legendary performers including Bill Monroe and the Louvin Brothers. Their version of the latter’s ‘Dark as the Night’ is one of the album’s better tracks along with the song ‘Born To Be With You’ borrowed from the catalogue of prolific songwriter Don Robertson. However the real strength of this album is the twelve self-penned songs split almost evenly between Drysdale and McMeekin including the co-written ‘Guilty as Murder’. There is virtually an interchange of their individual songs through the album’s progression with the only instrumental being Drysdale’s ‘Mad River Breakdown’. The usual subjects of this type of music are explored such as Drysdale’s ‘Moonshine Train’ and the wonderful tale McMeekin wrote about addressing your fears on returning to your roots in the song ‘Afraid To Go Home’. The good news for us British followers of this strand of roots music is the band is intent on taking their music overseas to pursue a wider audience. With this desire they have already planned a UK and Ireland tour in October and the opportunity to experience this very fine recording live, no doubt delivered in traditional style around a single mic, will not be one to miss. In the meantime seek out this record and celebrate the successful baton passing of old time traditional bluegrass roots music to the next generation.